Cutting Off the Effect | Doppsonline.com Dopps Chiropractic: Our family bringing health to your family for over 40 years! 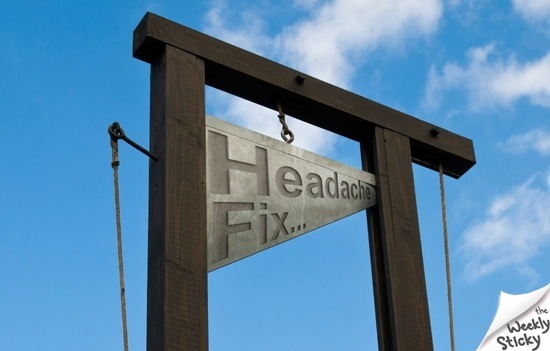 If predisposed to chronic Life debilitating migraines, no rational person would agree to a beheading to pre-empt the next one. But fear, misplaced faith and little knowledge of how the body innately works could influence such a move on ‘lesser’ body parts… like a gallbladder, some adenoids or a pair of tonsils. Healthy function is FIRST patterned in the Nerve System – then executed in the body. You can’t successfully wiggle your toes, secrete a hormone or heal a paper cut without an ‘innate’ command first emitting from your Nerve System and expressing itself in those parts. Likewise, for disease to manifest in the body, it too must be first patterned in your Nerve System. Treating or ‘pre-treating’ diseased tissue only addresses an effect after the fact. A CAUSE precedes both events, and should be addressed primarily if health is to be truly preserved. It doesn’t matter what or how many body parts you remove to avoid ‘potential’ illness… DIS-EASE will manifest itself someway, somehow if the cause (interference with the normal expression of Life via the Nerve System) is not addressed. It is far wiser to keep your head and get adjusted!